Oxford, Maine – Joey Doiron of Berwick outran DJ Shaw of Center Conway, New Hampshire to the checkered flag to win the Ripley & Fletcher Ford PASS 150 for Super Late Models Saturday at Oxford Plains Speedway. For Doiron it was his second victory of the season on the series. 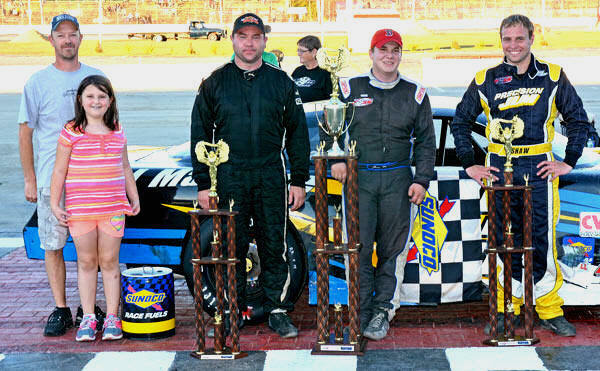 While Shaw came up a bit short in the race, his runner-up finish was enough to wrap up his first Pro All Stars Series Super Late Model championship. 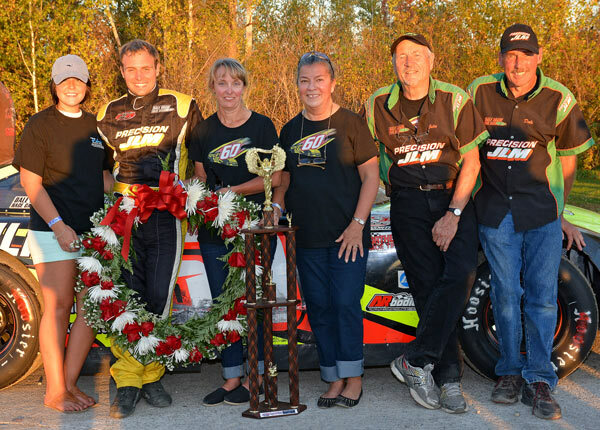 Late-race cautions gave Doiron the opportunity to battle for the victory with Standish veteran David Oliver, who dominated much of the event prior to the final restart with just a handful of laps remaining. 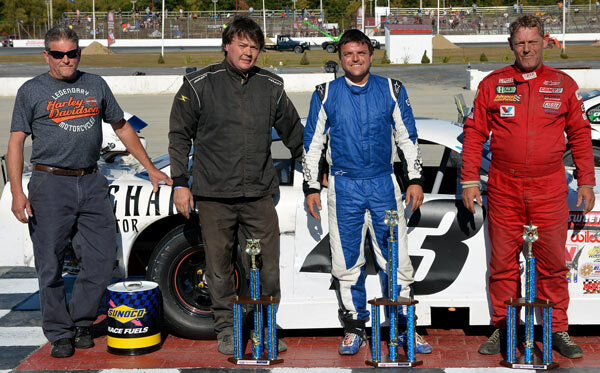 Oliver settled for a third-place finish, completing a sweep of the podium finishes for Dale Shaw Race Cars drivers. 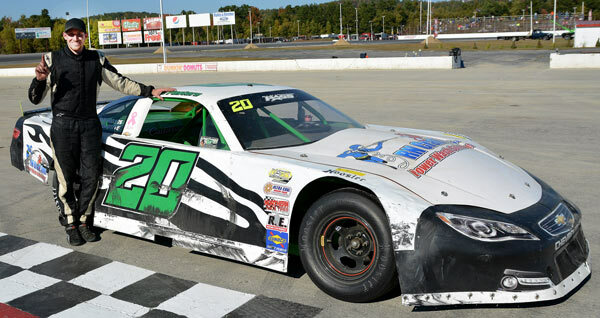 Johnny Clark of Farmingdale, the most prolific champion in Pro All Stars Series history, entered the event with hopes of overtaking Shaw in the championship standings, but came up a bit short with a fourth-place finish. Glen Luce of Turner ended up fifth both in the race and the 2014 championship standings. 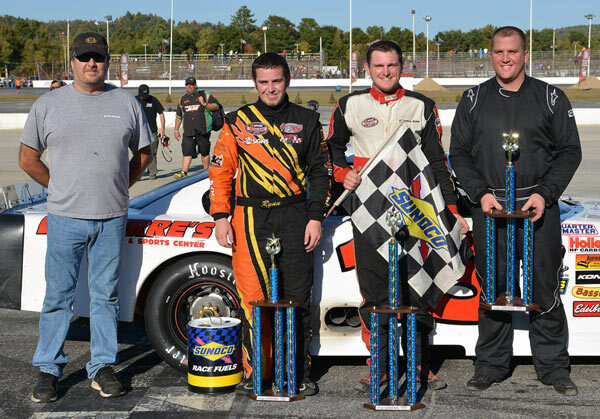 Scott Mulkern of Falmouth, Scott McDaniel of Livermore, early race leader Austin Theriault of Fort Kent, Oxford Plains Speedway legend Mike Rowe of Turner and two-time Oxford 250 champion Travis Benjaminof Morill rounded out the top ten. 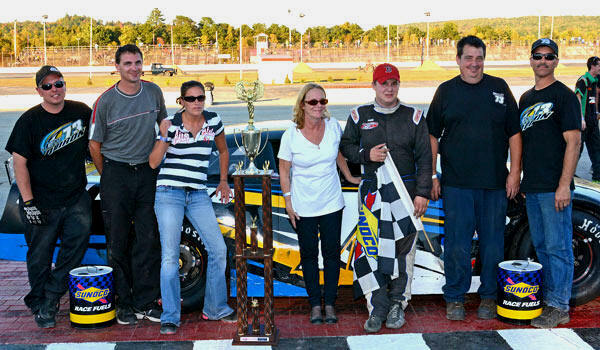 Mitch Miller of West Boylston, Massachusetts claimed his second victory of the season in the 40-lap PASS Modified main event. Former champion Mark Lucas of Harpswell was the best of the rest, with Lovell’s Evan Armington nailing down a third-place finish. 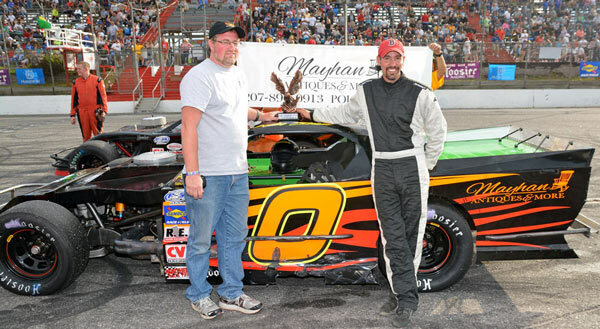 Andy Shaw of Center Conway, New Hampshire, another former champion, ended up with a fourth-place finish and claimed the series championship in the PASS Modified class. Brad Babb of Windham got by Corey Mason of Stark, New Hampshire late in the 50-lap race for PASS Northeast Late Models and claimed not only the race win, but the three-race series championship as well. Mike Kenison of Lancaster, New Hampshire made a late charge pay off with a second-place finish, just in front of series runner-up Ryan Morgan of Mystic, Connecticut. Ryan Deane of Winterport and Mark Lundblad, Jr. of Conway, New Hampshire completed the top five. 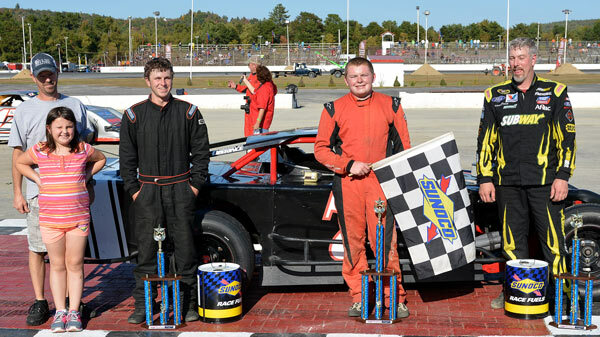 Multi-time PASS Sportsman Champion Dan McKeage of Gorham closed out the 2014 season in victory lane, but his 40-lap score was not enough to overtake his hometown rival, Joe Pastore, Jr., atop the series final rankings. Portland’s Scott Dorr prevailed in an entertaining, spirited battle for runner-up honors with Scarborough’s Frank Wear. Pastore wrapped up his title with a fourth-place finish. The winner’s father, Lyman McKeage of Gorham, rounded out the top five. Bobby Weymouth of Topsham got to the front of the pack early and drove to victory in the 25-lap headliner for the visiting NELCAR Legends cars tour. Trevor Sanborn of Parsonsfield, who destroyed his Super Late Model in a morning practice session, nailed down second-place honors in front of Lincoln’s Alan Smith. Mathew Burgoine of Newport stayed atop the championship standings with a fourth-place finish. Tyler Braunschweig of West Newfields rounded out the top five. Once Leeds racer Kyle Hewins got by early race leader Lewis Anderson of Buxton it was all over in the 40-lap Street Stock main event. Hewins dominated the remainder of the event, winning by over a half-lap over Waterford’s Richie Morse, making his first appearance of the season. BJ Chapman of Bridgton crossed the finish line in third position, followed by Auburn’s Mike Short and Corey Morgan of Lewiston. Justin Trombley of Winter Harbor patiently worked his way through traffic, took the lead from Turner’s Calvin Rose, Jr., and cruised to victory lane following the 30-lap Mini Stock feature event. Rose held on to second-place for the balance of the race, with Rob Greenleaf of West Bath claiming third-place spoils. Nik Coates of Lisbon abd Green’s George Fortin rounded out the top five. 2014 PASS Modified Champion: Andy Shaw, Center Conway, NH. PASS SPORTSMAN CHAMPION - JOE PASTORE JR. PASS Sportsman (40 laps) 1 43 Dan McKeage, Gorham; 2 60 Scott Dorr, Portland; 3 20x Frank Wear, Scarborough; 4 20 Joe Pastore, Jr., Gorham; 5 58 Lyman McKeage, Gorham; 6 01 Rob Drew, Lovell; 7 4 Jeremy Hall, Franconia, NH; 8 36 Nate Leavitt, Buxton; 9 1 Brad Hammond, Turner. 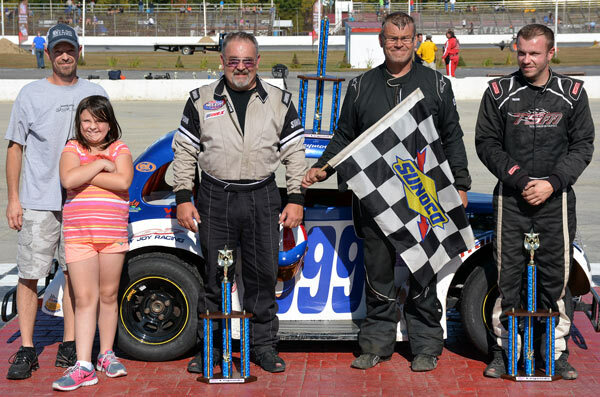 2014 PASS Sportsman Series Champion: Joe Pastore, Jr., Gorham. PASS Northeast Late Model (50 laps) 1 15 Brad Babb, Windham; 2 3 Mike Kenison, Lancaster, NH; 3 3 Ryan Morgan, Mystic, CT; 4 54 Ryan Deane, Winterport; 5 28 Mark Lundblad, Jr., Conway, NH; 6 21 Shane Clark, Winterport; 7 1 Brad Hammond, Turner; 8 1 Corey Mason, Stark, NH; 9 12 Bobby Pelland III, Cranston, RI; 10 36 Nate Leavitt, Buxton; 11 77 Dale Verrill, South Paris; 12 8 Keith Stuart, Naples. 2014 PASS Northeast Late Model Champion: Brad Babb, Windham. NELCAR Legends Cars (25 laps) 1 399 Bob Weymouth, Topsham; 2 29 Trevor Sanborn, Parsonsfield; 3 33 Alan Smith, Lincoln; 4 38 Mathew Burgoine, Newport; 5 70 Tyler Braunschweig, West Newfields; 6 96 Wyatt Alexander, Ellsworth; 7 8 Matt Chagnot, Derry, NH; 8 00 Phillip Brackett III, South Portland; 9 19 Kevin Girard, Old Orchard Beach; 10 10 Ed Getty, Gray; 11 27 Richard Humphrey, Parsonsfield; 12 81 Dan Winter, Windham; 13 42 Steve Johnson, North Conway, NH; 14 61 Garrett Johnson, n/a; 15 2 Darren Johnson, Pembroke, NH; 16 72 Mike Humphrey, Cornish. Street Stocks/Outlaws (40 laps) 1 51 Kyle Hewins, Leeds; 2 04x Richie Morse, Waterford; 3 58 BJ Chapman, Bridgton; 4 3 Mike Short, Auburn; 5 26 Corey Morgan, Lewiston; 6 81 Lewis Anderson, Buxton; 7 36 Rick Spaulding, Lisbon; 8 17 Gary Davis, Harrison; 9 40 Mac Hannan, Jr., Union; 10 33x Travis Burrows, Brownfield; 11 5 Guy Childs, North Turner; 12 33 Andrew Breton, Sabattus; 13 777 Mike St. Germain, Auburn; 14 4 Curtis Gleason, South Portland; 15 82 Chaz Briggs, Westbrook; 16 05 Glen Reynolds, Greene; 17 2x Adam Lovejoy, Sanford; 18 2 Dale Lawrence, Lewiston; 19 73 Troy Jordan, Poland; 20 1 Ed Connolly, Scarborough. Mini Stocks (30 laps) 1 34 Justin Trombley, Winter Harbor; 2 8 Calvin Rose, Jr., Turner; 3 2 Rob Greenleaf, West Bath; 4 4 Nik Coates, Lisbon; 5 9 George Fortin, Greene; 6 77 Ashley Marshall, Jay; 7 61 Chris Morris, Auburn; 8 2x Butch Keene, Turner; 9 14 Matt Moore, Mechanic Falls; 10 90 Desmond Skillings, Antrim, NH; 11 10 Jimmy Childs, Leeds; 12 4j Joe Katula, Lisbon Falls; 13 12 Darrell Moore, Mechanic Falls; 14 18 Tim Collins, Farmingdale; 15 83 Brady Romano, Liverore Falls; 16 25 Nick Skillings, Warner, NH.